Shannah Mousaco is supervised by Dr Laura Tarzia and Prof Kelsey Hegarty. She will look at GPs’ experiences of working with men who are perpetrators of domestic violence. This will be a qualitative study exploring General Practitioners’ experiences of intervening early with men who use violence in their relationships, and their view on how they can be best supported in their work. Gavin Wayne’s project title is ‘A good night’s sleep: Challenges and implications for Melbourne’s Homeless’. In recent years sleep deprivation and homelessness have both been recognised as key determinants of health. He will explore sleep in the homeless context, the challenges of obtaining adequate sleep, and the self-reported effects of inadequacy. He will be supervised by A/Prof John Furler and Dr Edmund Poliness (The Living Room). Cassandra Roberts is supervised by Dr Jo-Anne Manski-Nankervis, Dr Phyllis Lau and Ms Ruby Biezen. Her project title is ‘The use of electronic medical records (EMR's) and Antibiotic prescribing guidelines in the general practice setting’. She will explore what guidelines are being used and how decisions are made around antibiotic prescribing. This information will inform the design of a prototype Clinical Decision Support tool integrated within the EMR. Ellena Miller’s project on ‘Experience of miscarriage: a male perspective’ will involve interviewing men whose partner's have miscarried to investigate male perspectives, personal experiences and interactions with healthcare professionals, and family and friends during this time. This research will aim to provide a better understanding of resources and support to help men affected by miscarriage. She will be supervised by Prof Meredith Temple-Smith and Dr Jade Bilardi. Georgina Clarke’s project title is 'Understanding service delivery to LGBTQI clients at Safe Steps family violence response centre.' She will be supervised by Prof Kelsey Hegarty and Gemma McKibbin. She will conduct interviews with staff at Safe Steps to understand their perceptions of service delivery to LGBTQI clients. It will provide insight into the barriers and facilitators of care for these clients and how services delivery can be improved. Sonia Srinivasan’s project title is ‘Women's experiences of reproductive coercion, and their expectations of health professionals in this context’. 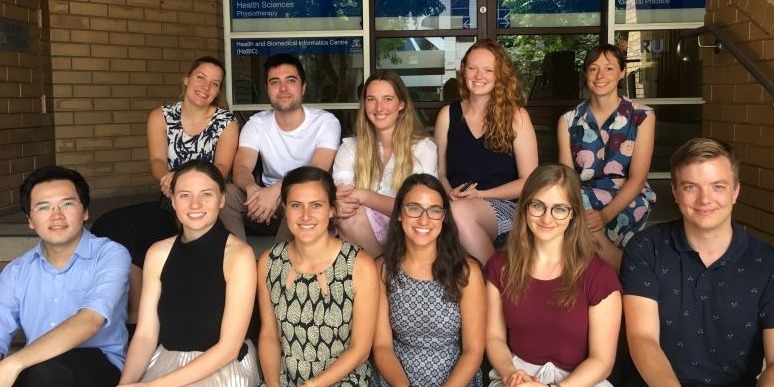 She will carry out interviews with women recruited from the Royal Women's Hospital health clinics and CASA support network, to understand the Australian women's experiences of reproductive coercion and their expectations from their health professionals. She will be supervised by Dr Laura Tarzia and Prof Kelsey Hegarty. Stephanie McMahon will be supervised by Dr Jenny Walker, Prof Jon Emery and Ms Sibel Saya on her project – ‘BRISK-M: The views of female primary care patients, aged 35-70 and at moderate risk of breast cancer, on the therapeutic prevention of Breast Cancer’. This study will explore the knowledge and attitudes of female primary care patients, at moderate risk of breast cancer, with regards to the therapeutic prevention of breast cancer. It also aims to explore these women's decision making processes on whether they would or would not take these therapies. India Jones’ project is about ‘Evaluating doctor’s perceptions of their role in family violence identification and response’. She will look at how doctors working in the antenatal clinic at the Royal Women’s Hospital perceive their role in identifying and responding to family violence. Her project will be part of the larger SUSTAIN project looking at how women want to be asked about family violence in the antenatal setting. She is supervised by Prof Kelsey Hegarty and Jenny Chapman (SHRFV). Miriam Oldfield’s project title is ‘Exploring the use of pharmacological and non-pharmacological therapies in chronic non-cancer pain management in general practice’. She will be supervised by Dr Phyllis Lau and Dr Jane Crowe. This project will explore GPs' experiences of chronic (non-cancer) pain management and use of non-opioid and non-pharmacological therapies. It aims to provide better understanding of this topic, which is particularly relevant considering recent legislative changes to patient access to medicines containing codeine. Vasilios Stylianopoulos is supervised by Dr Victoria Palmer and A/Prof John Furler. His project on ‘Reducing Cardiovascular Risk - Engaging People Living with Serious Mental Illness in an Acceptability and Feasibility Pilot Intervention of Assertive Care’ will identify the barriers and facilitators present within a tailored treatment program with the aim of reducing cardiovascular risk in people living with serious mental illness. The treatment program is influenced by principles of Assertive Community Treatment and will be utilised in a future randomised control trial. Veng Hieu’s project will look at ‘The working life of a GP’. He is supervised by Prof Meredith Temple-Smith and Dr Jane Crowe. According to BEACH data, general practice is experiencing a lot of changes. However, little is known about the tasks of GPs in their work. This study aims to explore the tasks (clinical, non-clinical) that are within a GP’s working life and how that has changed over their career.